The Wilcox House was built in 1903 by William Markham, inventor of the BB Gun and the co-founder of the Daisy Air Rifle Co. George and Harriet Wilcox purchased it in 1911 and raised their family that included three children, Julia, Katherine, and Johnston (“Jack”). Originally, in the side yard, a continuously flowing fountain spilled over into a large reflection pool. A pergola, gazebo and statuary were focal points on the extensively landscaped grounds. The grounds also proudly displayed exotic plants, unusual trees and rare shrubs that Mr. Markham imported from around the world, including Amabilis Peonies, and Ginkgo, Black Magnolia and Copper Beech trees. During World War II, as part of the war effort, the home was converted into five apartments. Fulfilling a bequest of Jack Wilcox, who was born in the house and lived there for most of his 83 years, the stunning 10 foot stained glass window, that was originally in the Solarium on the first floor, was donated to the Plymouth Historical Museum where it now creates a dramatic entryway display. 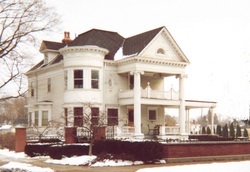 Just before he died in June, 2000, Jack Wilcox sold the property with the vision that an attractive condominium project would be built around the house and with the hope that the house would be preserved so that it might continue to shine as a symbol of the City of Plymouth and serve as a vivid reminder of its storied past.